Long Ropes - Website of victoriamountz! Freshwater pearls, tiger's eye, and glass crystal beads are French knitted with bronze coated copper wire into a long rope. Measures 48" in length and is approximately 3/8" thick. The fastener is hand twisted with coordinating wire. Sales tax is included in the price. Freshwater pearls , gemstones and glass crystal beads are French knitted with bronze coated copper wire into a long rope . It measures 48" in length and is approximately 3/8" thick. The fastener is hand twisted with coordinating wire. Sales tax is included in the price. Fresh water pearls, treated quartz crystals and glass crystal beads are French knitted with bronze coated copper wire into a long rope. Measures 48 1/2 " in length and is approximately 3/8" thick. The fastener is hand twisted with coordinating wire. Sales tax is included in the price. Fresh water pearls, labradorite and glass crystal beads are French knitted with bronze coated copper wire into a long rope. Measures 48 1/2 " in length and is approximately 3/8" thick. The fastener is hand twisted with coordinating wire. Sales tax is included in the price. Fresh water pearls, treated quartz crystal, and glass crystal beads are French knitted with bronze coated copper wire into a long rope. Measures 48 1/2 " in length and is approximately 3/8" thick. The fastener is hand twisted with coordinating wire. Sales tax is included in the price. Glass crystal beads are French knitted with bronze coated copper wire into a long rope . Measures 48 1/2 " in length and is approximately 3/8" thick. The fastener is hand twisted with coordinating wire. Sales tax is included in the price. Freshwater pearls, crystal and glass beads are French knitted with bronze coated copper wire into a long rope. Measures 48 1/2 " in length and is approximately 3/8" thick. The fastener is hand twisted with coordinating wire. Sales tax is included in the price. 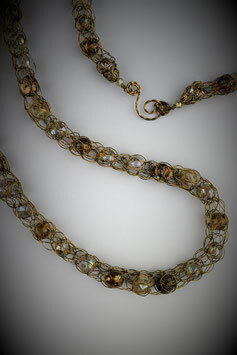 Glass crystal beads are French knitted with bronze coated copper wire into a long rope. Measures 48 1/2 " in length and is approximately 3/8" thick. The fastener is hand twisted with coordinating wire. Sales tax is included in the price. Freshwater pearls, turquoise colored gemstones, crystal and glass beads are French knitted with bronze coated copper wire into a long rope . Measures 48 " in length and is approximately 3/8" thick. The fastener is hand twisted with coordinating wire. Sales tax is included in the price. Freshwater pearls, crystal and glass beads are French knitted with bronze coated copper wire into a long rope. Measures 48 1/2 " in length and is approximately 3/8" thick. The fastener is hand twisted with coordinating wire. Freshwater pearls and crystal and glass beads are French knitted with bronze coated copper wire into a long rope . It measures 48 " in length and is approximately 3/8" thick. The fastener is hand twisted with coordinating wire. Sales Tax included in price. "Shades of Amethyst" Beaded French Knit Rope Necklace 3/8"
Freshwater pearls and crystal and glass beads are French knitted with bronze coated copper wire into a long rope . It measures 48 1/2 " in length and is approximately 3/8" thick. The fastener is hand twisted with coordinating wire. Sales tax is included in price.